The answer is yes, because of three reasons. First, the data sent over SSL connection must be encrypted. This is done very fast, but still requires additional CPU resources in comparison with unencrypted HTTP, especially for sites with mainly static content. Second, SSL handshake takes additional time and resources. If, for some reason, the connection is reopened frequently, the impact will be higher. Third, some components of your application may start working differently after the switch. This refers not to the web server only. Even though in most cases this problem does not take place, you still need to load test the site in order to make reliable conclusions. The next question is if you can apply the same tests with just the protocol type updated? The answer is: “yes, but this is not recommended”, which actually means “no”. The reason is that you will have to update too many places, because sometimes URLs are contained inside the POST data. Even if you do this work carefully, you cannot be sure that your application sends exactly the same sequences of requests as before. So, it is very much recommended to remake the tests. 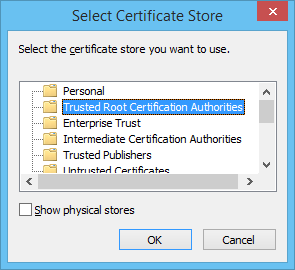 By default, WAPT will try to install that certificate automatically. It will prompt you for that when you try recording an HTTPS web site for the first time. You need to have administrative rights on the system to complete this process. You can also do this manually from the Setting dialog. Click the “View/Install Certificate…” button for that. 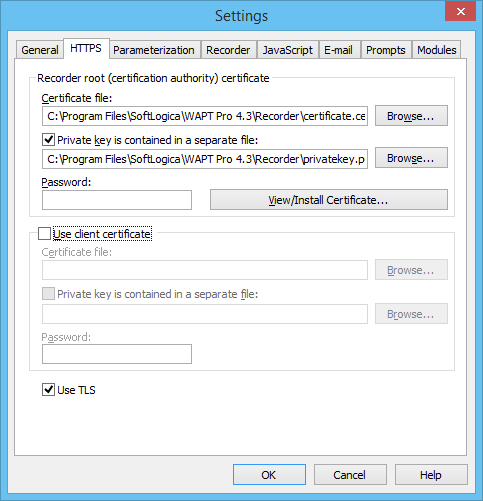 If certificate is installed properly, your browser should treat the connection as secure and you should be able to record the site without problems. The good news is that everything else is done for HTTPS sites exactly the same way as before.